Pituitary adenylate cyclase activating polypeptide (PACAP 1-27) is a potent PACAP receptor antagonist. ESI-09 is a specific exchange protein directly activated by cAMP (EPAC) inhibitor with IC50 of 3.2 μM and 1.4 μM for EPAC1 and EPAC2, respectively, >100-fold selectivity over PKA. PKA but not Epac blockade reversed the JWH133-mediated effects on the microglial phenotypic conversion. PKA (H89) or Epac (ESI-09) specific inhibitors were treated with JWH133. qPCR was used to investigate mRNA expression of the M1 markers CD86 (A) and CD68 (B), as well as the M2 markers Ym1 (D) and CD206 (E). Western blot analysis was conducted, and the relative CD68 (C) and CD206 (F) densities were evaluated for further determinations. The data are expressed as means ± SD. **P < 0.01, ***P < 0.001 vs. Throm; #P < 0.05, ##P < 0.01 vs. Throm + JWH; n = 3 per group. PACAP 6-38 is a PACAP (pituitary adenylate cyclase-activating polypeptide) non-stimulating competitive antagonist with an IC50 value of 2 nM. It also acts as a functional CARTp antagonist in vivo. HJC0350 is a potent and selective EPAC2 inhibitor with IC50 of 0.3 μM, exhibiting no inhibition on Epac1. SQ22536 is an inhibitor of adenylyl cyclase with an IC50 of 1.4 μM. It can inhibit PGE1-stimulated increases in cAMP levels in intact human platelets. Effects of AC inhibitor SQ22536 on A20 cell proliferation and expression of cAMP, Reelin, CDK5, IL-10 and caspase-3. (A) The expression level of cAMP in A20 cells treated with SQ22536 using ELISA assay. (B) The proliferation rate analysis of A20 cell treated with SQ22536 using CCK-8 assay. (C) Western blotting determined the expression levels of Reelin, CDK5, caspase-3 and IL-10 in A20 treated with SQ22536. **p<0.01. Bithionol is a potent inhibitor of soluble adenylyl cyclase(sAC) with an IC50 of 4 μM and has antibacterial and anthelmintic properties along with algaecide activity. PACAP 1-38 is a highly potent PACAP receptor agonist (Kd = 100 pM). 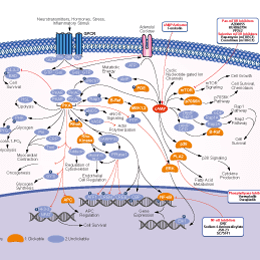 It stimulates adenylate cyclase and phagocytosis.